A more elegant and easy way to build an multifunctional adapter for ListView or RecyclerView in Android. ###Why NoListAdapter? Using this library, you don't even have to write an adapter for a ListView or RecyclerView. When using RecyclerView， I found it is not convenient and elegant to realise multi-type item. Moreover, there is no native way to set empty view, header, footer, load more footer and error view in RecyclerView. Although we have many implementations, I think adapter is quite qualified for those task. Easy to Add Multi-type item to RecyclerView and ListView. Easy to set empty view in RecyclerView. Easy to add header and footer in RecyclerView. Easy to set Load More Footer in RecyclerView. Easy to show or hide error view in RecyclerView. //if you want to use in listview, add this line. //if you want to use in recyclerview, add this line. // setter and getter omitted. Just Create DataBean and ViewBinder for each Item type and add it to your Adapter Builder. .addItemType(new UserRecyclerViewBinder()) //different item type have different ways to bind data to ViewHolder. Then show and hide Error View if you want. Create Footer ViewBinder, Check out more information in this sample. // to load more data. Note: setLoadMoreFooter should be added behind addHeader and addFooter. When getting Refresh or Load More data, just call FooterLoadMoreAdapterWrapper#OnGetData, it will handle pagination for you. No mater in ListView or RecyclerView, the adapter is in charge of providing view holder and binding data to each item view. Furthermore, different type items with different layout ids should have different data beans and different ways for databinding. So it would be more fixable and elegant to separate business code of binding data and providing view holder from the adapter. Instead, ViewBinder will handle those task. DataBean holds the data and an item layout id. 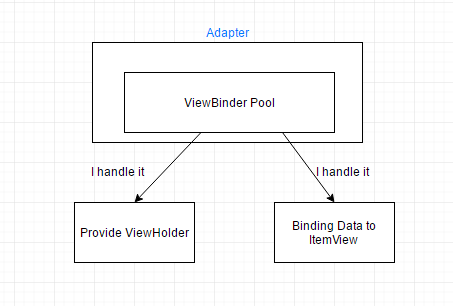 With layout id, it provides ViewBinder to bind data to item view in Adapter's method such as onBindViewHolder in RecyclerView and getView in ListView.